Thai silk and carved teak elephants are not the hottest items to bring back home to your family and friends from a trip to Chiang Mai; instead, go for the Nam Prig Noom. 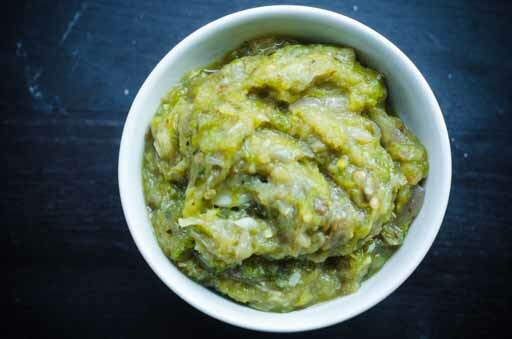 A spicy green chili sauce, Nam Prig Noom, is a true reminder of eating and being in the north. Part of the fun about visiting Chiang Mai is sitting down for a Khantoke dinner at the end of the day and watching the traditional Thai dance. Nam Prig Noom, sticky rice and pork rinds and other dishes are served on a raised tray while you sit on the floor waiting for the hosts to come around with your delicious food and drink. After you’re fed, walk over to a night market and take the fun of northern Thailand in. 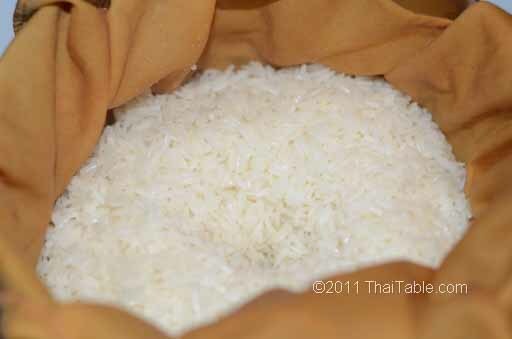 Then, before leaving Chiang Mai, visit Warorot Market (Kad Luang) or other markets in Chiang Mai to see Nam Prig Noom in packages and containers for your friends and families. This recipe is a vegetarian, traditional and authentic. Nam Prig Noom sold in Bangkok often has lime juice, fish sauce and/or pickled fish. 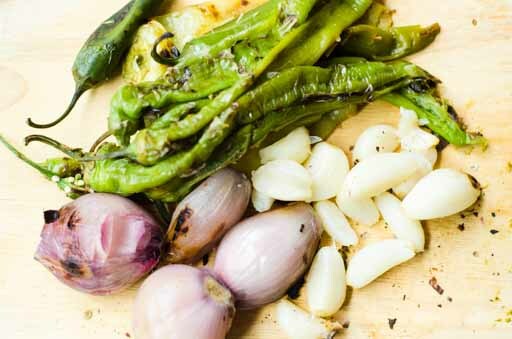 In the north, it’s far simpler: chilies, garlic, shallots and salt. 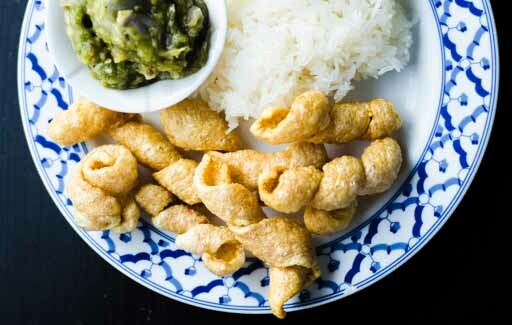 Nam Prig Noom goes exceedingly well with sticky rice and pork rinds. I use a combination of hot and sweet peppers to get the right heat level. 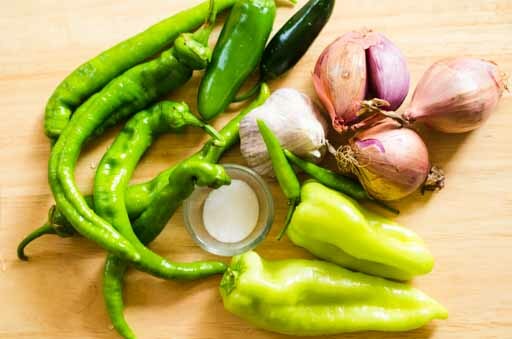 The jalapeno peppers and Thai chilis are for heat and flavors. The sweet peppers are for flavor and volume. Together you can reach the right balance for you. Grill or pan roast all the ingredients together except for salt. 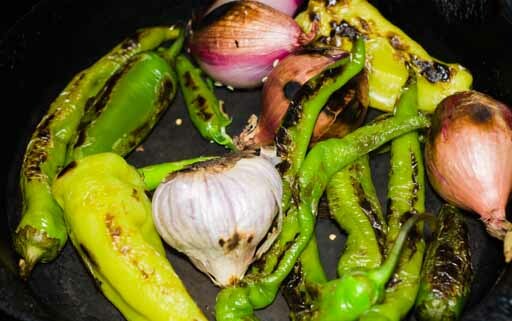 It takes about 15 minutes to roast the Italian peppers -- then take them out. Then another 5 minutes and the rest of the ingredients are roasted. Remove from the pan and scrape the burnt parts off with a knife. Peel the skin off from the garlic and shallots. 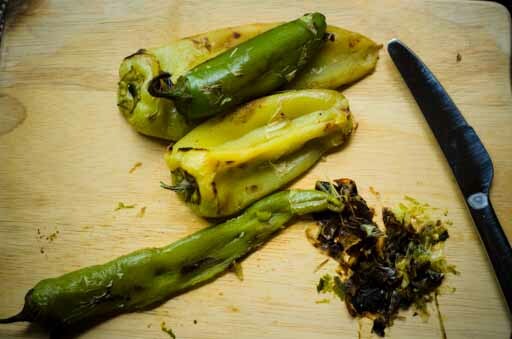 Remove pepper stems. Pound all the ingredients including salt in a mortar. The final mixture should be rough with chunks of ingredients. 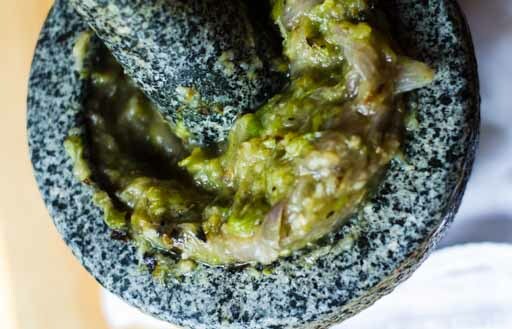 You can also use a food processor instead of a mortar and pestle. Taste to see if you need more salt. Add all ingredients to the food processor. Pulse the ingredients quickly to get a rough chop. It should take a few pulses to do the job. You want some texture in the sauce. I find it easier to cut the rinds when they're somewhat dryer. 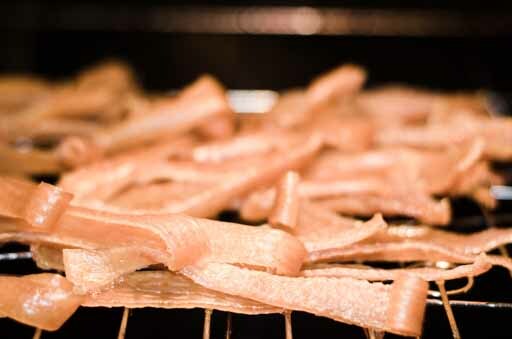 But if you can cut them into strips when they’re fresh, there is no need to dry them halfway first. The oil should be hot but not smoky. If your oil starts to smoke, turn down the heat. You can sprinkle a small amount of salt and serve as snacks. Rinse the pork rinds well. 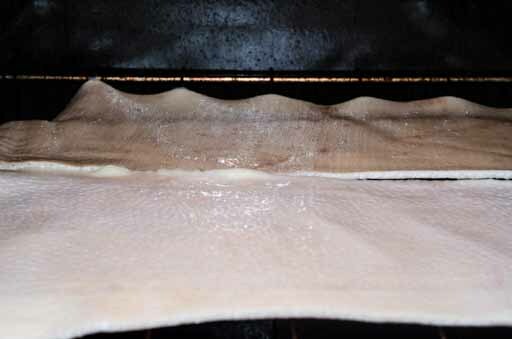 Let it dry in the oven at 170 degrees Fahrenheit for an hour or until dry enough to cut but not too dried out. 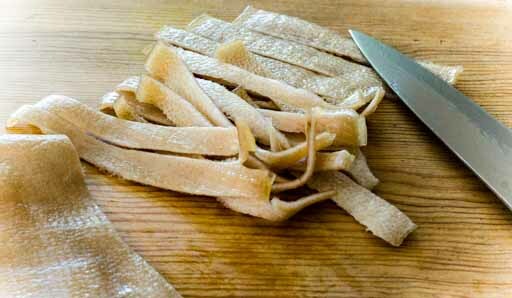 With a sharp knife, cut and pull the pork rinds into strips, ¾ inch. 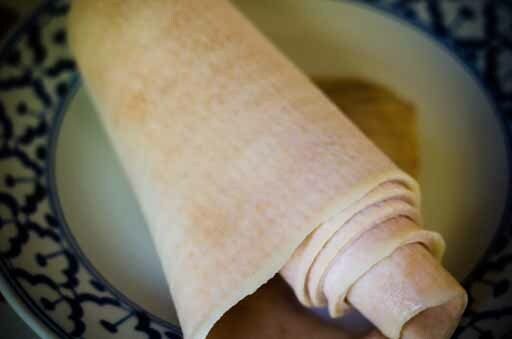 Hold the knife down with one hand and pull the sheet up to cut. The strips should be about ¾ inch in width by 4-5 inches in length. You want the oil to be very hot for the pork rinds to puff up. Add the oil to the wok, cast iron or fryer. 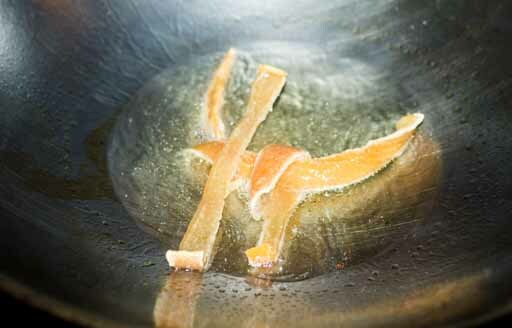 Test the oil temperature by putting a small piece of rind in the oil. If the rind puffs up right away, the oil is hot enough. Add the pork rinds to hot oil. It may start to splatter, you may want to wear oven mittens to protect your arms and hands. Move the pork rinds around in the wok so that they all can come into contact with the oil and puff up. Push the pork rinds under the oil to get all spots that you may miss. 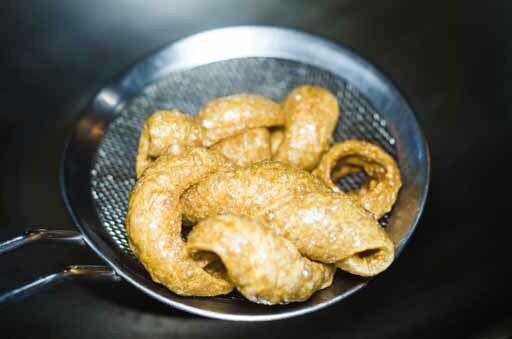 Once when the pork rinds puff up, it takes no more than a minute to be ready. Remove the rinds and drain the oil. Serve with Nam Prig Noom or as a side to noodle soups. 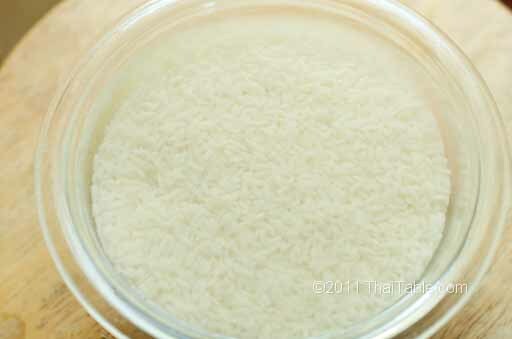 Store the rinds in an airtight container to keep them crispy.